Rarity from the Hollow is adult literary science fiction filled with tragedy, comedy and satire. A Children's Story. For Adults. Author proceeds have been donated to a child abuse prevention program in the author's home state. 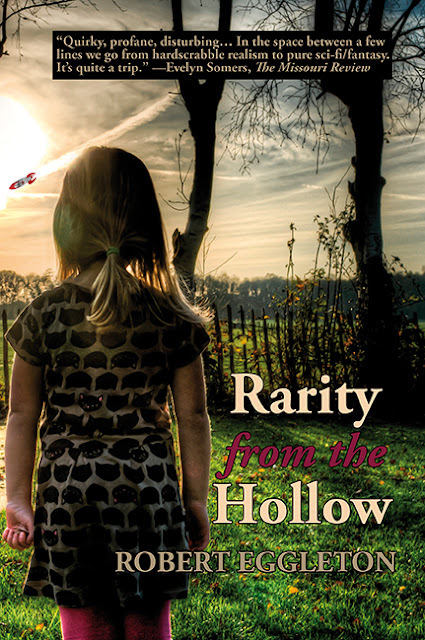 http://www.childhswv.org/ A listing of services that are supported can be found here: http://mountainrhinestones.blogspot.com/2015/06/review-giveaway-rarity-from-hollow-by.html. Rarity from the Hollow is not my usual kind of read but I thought I would try out something new. Reading Rarity from the Hollow is like reading two books. The first third of the novel is dark and revolves around Lacy Dawn surviving the childhood trauma of being raised by an abusive father and an inept mother. This is where the realism ends. The rest of the book makes for strange reading. Lacy Dawn converses with trees, the ghost of her friend Faith and a robotic boyfriend called Dotcom. Lacy Dawn plans to cure her parents by plugging them in and downloading an upgrade. When she succeeds, she is then given the task of saving the universe. The story is fast paced, very imaginative and quite entertaining. There is humour in the story but it wasn't anything that made me laugh out loud. If you like toilet humour then you'll like this book. I'm not a fan of sci-fi and probably some of it went over my head. I would have enjoyed this more if it had have been more of a gritty tale of Lacy Dawn overcoming her family difficulties in a more realistic way. I didn't like the idea that a child could cure her parents and save a marriage. The parents faced no repercussions for their actions. Not one of the adults in this book was likeable and they became even more unlikeable after they were cured and helping Lacy Dawn to save the universe. I really didn't like how inappropriately they behaved in front of her and the inappropriate conversations they had with her.